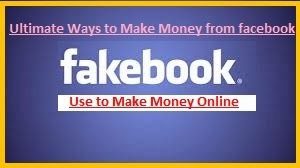 I was looking for a new way of making money online that is from Facebook Pages, so I have started researching, what are most possible ways to make money online from Facebook. Facebook is one the largest social networking website in the world, then it is obvious that you, me and of course our friends also are using it, that means, if we can find out a way to make money online then it would be quiet easy for us to make money from Facebook. So, I am going to share with you those ways and also I am going to share with you ideas for those ways that's why, if you are even newbie you can figure out, how it will work for you like a perfect business. These reasons are good enough for any one to get start with Facebook page! Here is the big questions, may be arising in your mind i.e. I know you are thinking about it. How can I make money with it? Wait dear I will come to it, but let me tell you first ideas for creating page. See, It is easy for creating a page may be any fun page and finally make it popular, but those fun pages will not going to make you money easy but if you will create a fun page related to any service or any product or any topic which is having products to sell then probably you are going to make money quiet easy, because this is one of the best way to make money no need to invest money but you have to invest your time to do it. I think these ideas are good to create a page and make money from Facebook, but the question is that how to monetize your Facebook page. That is the big questions! Because, if you will not make money then how would you keep growing your Facebook page. One good recommendation for you. Go for affiliate marketing, you don't need to do anything special you just need to choose a affiliate products. It's not that much difficult. It is quiet easy even, but you need to promote product after having at least 1000 likes of your Facebook till that time you need to keep giving value in your Facebook page that's why people will share your Page and I think which is the best way to increase likes. What You Should Do, If You are a Busy Person? I was thinking, if someone is doing job or may be student or family business owner or may be house wife then what should they do to make it possible, because they will not have parallel time to do it. That's why I found few apps for this, those apps will allow you to make a schedule of it, I mean you can schedule your posts to your profile, to your pages, to Groups. Post Planner- Post Planner will help you to make schedule to post to your profile or to your page. I found something a special of this apps, I was thinking, why should not I share this information with you. Here is great information about it, it will also give you an idea, what to post? You can say this in simple language it will work for you in the absence of you. This is also like Post Planner, which will help you to make a schedule your post to your Page as well as to your profile also. Facebook one of the most interesting part is groups but this is little different from pages, because in group you can chat with groups of people although individual people also having this options. But I will not recommend you to chat with any one, this is totally wastage of time, sometimes it is good but don't habituate of it. Just use it for making money, for marketing, for better tomorrow. Actually there are two ways to do it, create your own group and them promote product otherwise. Which one is my favourite use other groups to promote affiliate products. But this is not going to help you that much as much it will help you by creating a group, because you will promote those products anonymously for member of those groups and for your own group you will known for almost all. Although, it will work for you up to extent, most important without more effort. See, there are not any list of open groups in the internet where you can promote affiliate product. Then you have to make a list from yourself, probably you are thinking how did you do it? Choose a Niche of Your Affiliate Products then search on Facebook group on that niche, so simple but once you will make a list of it then it will be quiet easy to do it. Like, if you will promote books related products on colleges or universities or any students groups then probably you will get more sales. But make sure you will not choose a product which is more costly because students are not going to afford more costly product. Keep in mind, I mean to say always understand your customers, their needs, their conditions. Applications are changing the world, the most recently people are making millions from creating apps, but the thing is that how would you do it? That is exactly I am going to share with you. See, if you want to create apps on Facebook then there are two ways to do it, either you learnt how to do it or buy a software which will make you easy to do it. Just like software make people to do blog quiet easily, even don't need to have any kind of technical language. Just like to create an apps don't need to have technical language, so I have started hunting software for it. Finally I got it and I am really happy for it. I think you should try this software, who knows probably it can change your life, if you don't like it then go for getting professional coaching to create an apps on Facebook, because it takes more time to learn online for free probably you will not even get pro staff online. Facebook is one of the biggest market place to buy and sells products then this is obvious that people are buying products through Facebook and also selling products, now see Facebook campaign marketing is not that much popular as Google Adwards, but even then Facebook is a great opportunity like you and me to promote others product and make money, but don't forget to collect emails, in details I am going to discuss in the next sections. Well, I mean invest some money and then choose an affiliate product then promote but remember don't invest your whole money in a single time, first test the product, if the product is profitable for you then go for big investment. See, in this you need to give more and more time to understand the basics concept because there is competition in the market but not like getting day job. I will recommend you to learn from Professionals, he is one of the most successful internet marketer from last about 10 years. But it's a paid program, but it's worth it. Then why not to give a try, even you can watch how is this program going to make huge money for you, watch that video. Ideas to Make a Huge List of Emails- first of all you need to have an email marketing service provider, well there are many email marketing service provider, but according to me, if you wanted to be really get into this then use Aweber otherwise you can use Feedburner for Blogger Guide. See people are not going to subscribe your list for free, because every is one offering it then what you are giving extra that's why people will see it differently. That's why it is necessary to give a free away ebook but the ebook must be related to your Page, if you want to get more conversion rate. It will also help you to sells product after giving a free away, but you have to give value in the free away that's why people will get value of reading that ebook. The best free away is ebook, which is easy to create but you have to give value into it, that's why people will get help and then they will trust on you. In business trust is almost everything. Then after, it would be for your time, i.e. whatever you will promote it will make you make money. Make sure people will trust on you for forever, for this you must not look at only commission you are making just concentrate on how much value the product is having, that should be your target, if you want to make them customers for forever. Probably you know the real business is making customer forever! If not then remember this. I have very good tips for you regarding promoting a paid product to your mail list, first use the product from yourself. If you think it is worth it then promote it, in this way you can promote the product also better way, I mean you can show your email lists by giving an inside views of the membership program, which will improve trust and also it will make you confident about the product. In business you need to satisfy first yourself from the product, before promoting the product to your list put your self as a list of your email member. That's why car companies give test drive to people to make them satisfy about the product, you and me both know which is working for them. Then why not first check yourself about the product then promote to your list. That would the test drive for your readers and of course for you. Go to Email Marketing Software Like Aweber(Already Said). Make a Short Link Your Email Subscriber Box. Promote Short Link on the Cover Photo Of Your FB Page. Promote Your Links on your Profile, Facebook Ads, Open Groups. Short links means use short link urls provider to make the short that's why you can promote that link quiet easily like goo.gl, tinyurl.com etc. Don't promote product on the first day dear! First know about the product, what the product is about, here I have good tips for you, choose a product related to your e-book you have free away to your email list. Then try to send at least three emails regarding the product but not directly! This means don't tell your email list about the product, tell the objective of the product and how to achieve it. If you are going to promote a product related to Facebook apps then write what are benefits of creating Facebook apps, how many ways to do it, how to monetize your Facebook apps, then one example of some one who already succeed in this field. Then wait for few days at least for 3 to 4 days then promote the product with proper explanation but don't make it too long not even too short. Making money online is easy, if you know the way to do it, I think Facebook is the great way to make money online, but it's not like that you are going to make money today or may be tomorrow, it's not about possible, although nothing is impossible, even then it will take time. But you can do it, because many people are doing it. One more sentence I would like to share with you, hopefully you got great value from this article. Is there any other ways to make money from Facebook? Thank you very much sir, is their any thing that I can help you, let me know.